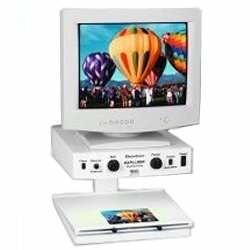 The PC compatible Video Magnifier connects to the SVGA monitor. Now you have an integrated work station. Press the foot switch and you can move between viewing your computer images and your CCTV images. It is flexible and ideal for work to read, write, review charts or photos or maps. 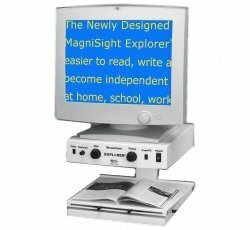 Magnification is 4x to 70x depending on your monitor size. The variable brightness control adjusts for contrast. Can set up the camera and the monitor separately (side by side or stacked). Select a color and line marking are available options.